Finance minister Lim Guan Eng has reiterated that the government will not sink any funds into the proposed new national car project (NNCP). The project, championed by prime minister Tun Dr Mahathir Mohamad, requires huge capital outlays and as such, it needs the involvement of the private sector, he said, reported by Bernama. However, the proposed NNCP can benefit from the government’s allocation for research and development (R&D) activities, as enjoyed by local players Proton and Perodua. “To date, the government has no such allocation (to invest in building a third national car) under Budget 2019 except for R&D. What is wrong in us carrying out R&D if it could be used by Proton or DRB-Hicom…not necessarily for the third national car. “To build the third national car will require investments running into billions of US dollars, not just RM10 or RM20 million. 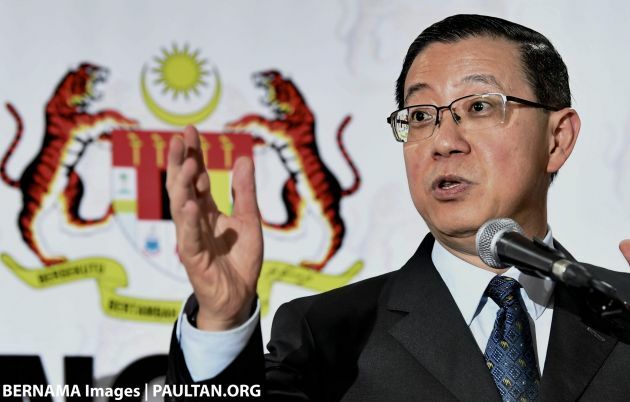 This we have to take cognition…for those who are attempting to make frivolous claims, we hope they do not make assumptions based on inaccurate and baseless information,” Lim told reporters in Butterworth on Saturday. He said that in reference to several quarters including the opposition, which accused the government of investing in a third national car project, which is not universally popular among Malaysians. Lim added that R&D is something which should be encouraged and the government encourages any party to carry out such activities to make Malaysia an innovative country. At the APEC Economic Leaders’ Meeting in Papua New Guinea last month, Mahathir hailed the automotive industry as a driving force for other sectors of the economy, particularly engineering. “A car is a kind of catalyst for other things. If you want to learn manufacturing of certain products, engineering-wise, you have to start with a car. To make a car, you have to make 4,000 different components and then put them together. It’s not easy, but we have mastered it in a very short time. Now we can design, produce the prototypes, test, do the clay models, everything. Even the engines, we can produce ourselves,” he said. “Nowadays when you design a car, you don’t draw on a piece of paper. You use technology to design, look around, look inside, see every angle, place it before a building to see how it looks like. Today, our people can design those things. If we didn’t have a motor car project, I doubt whether we could have mastered all the new technologies with regard to design,” the PM added. To recap, in October, entrepreneur development minister Datuk Seri Mohd Redzuan Yusof announced the timelines for the NNCP – the new national car’s name will be announced by the end of this year, while the prototype for the NNCP model is expected to be ready by early next year, ahead of a 2020 roll out. The car is expected to feature semi-autonomous capabilities and advanced safety features, while remaining affordable. The ministry of international trade and industry (MITI) has received over 20 proposals for the NNCP. Keep on telling no gov fund involved when the bigger question is will it jack up car prices. This is like the previous guy that keep on telling he did not steal peoples money but struggling to tell how he got the money. Proton dan Perodua R&D Syukur amat… Finance minister cekap ! Providing allocations for R&D not considered as investment ? Ini apa logik? How sure are you that these R&D “allocations”will be used for all carmakers across the sectors? Furthermore the so called other carmakers should already have their own R&D funds lo, why need this new allocation, for 3rd National Car project ma say lo. Putar sana sini, adui…. Wooww LGE. Not bad idea since Proton and DRB doesn’t have good R&D department except R3 Team that not too shining anymore. Maybe it’s a good chance for R3 Team Proton to develop their team skills in carmaker product quality to make the future proton can produce their own car without rebadge other car even they had a JV with other company. Also they can learn from Geely R&D team to make a better,safer, EEV and hybrid car by Malaysian Carmaker. Perodua included too. Hope Proton and Perodua will become global car one day like BMW and so on even it will take sometime to be a better company. BMW and other import car’s start from zero before nowdays. New glass with old water.. Taste is still bad! With the name of R&D, bailout look suci! New MY is just a signboard to cover for Older MY. You don’t need a national car project to make investments into RnD. We should technically already know how to screw a car together. There are enough car makers out there that would be more than happy to buy components. The best ones out there don’t even make a car. You don’t need to know how to make 4000 parts that go into a car. You just need to know how to make 500 pcs of that really really well, then sell the parts. the moment new government fund the new car project, that’s when the citizen’s will be dissatisfied. Proton has declared billions in R&D while they are only able to sell in low end segment – Saga! Najib agreed to pay the R&D cost, claimed by DRB Hicom that they loss the money as government changed policy! So, who at fault? Najib or Tun M? Can anyone believe that Saga need billions R&D ??? Why we need Perdana? while all knowing that rebadge of Accord might just work if it can be sell below 90K! What R&D can Malaysian champion in automotive industry? We all knowing the facts that event the Korean, Japanese also tried very hard all this years, but still far behind Germany! Malaysian just need an assembry plant, to scew all pieces into one car! We do not need R&D !!! Jepunis failed with takata, germany failed with dieselgate, koreans also failed with cheating FC. Free R&D allocation is worse than investment. Investment – you have some say in how the company is run, and if profitable, you get direct profit share. The taxes, multiplier effects still there if car succeeds. yes, only local workers lazy issit? then have to change pm osso la, hes local too..so whos the rajin one? let guess, the slant eyed kaki tipu one right? i konow this will never see light of day one sbb PT pun sama je- kutuk melayu = ok, kutuk bangsa lain = rasis. He said local workers, not Malays. Anyway, I’ll let this see the light of day, see if anyone else agrees with this sentiment. Bro Haf. We know exactly whom he is implying in his nearly every article diatribes against P1. Using a fake Malay name is a just sick cover to disguise his sick mentality. I hope PT can moderate better than that. What ? People said clearly LOCAL workers and you be the sensitive inferior complex syndrome triggered said he’s referring to Malay ? That’s why I agree with PM there are many uneducated people in Malaysia. Starting with you. Becoz what basher said is clearly a lie against P1 workers. If u ever went to both their plants, they have never a free time to sit around, unless its their breaktime. Aiyo,feel like slapping this joker lge…mcm old gov,what I say,u semua orang mesti percaya & terima.Tak boleh kritik & argue. With your logic, Proton old days didn’t sell any car, only hot pisang goreng.